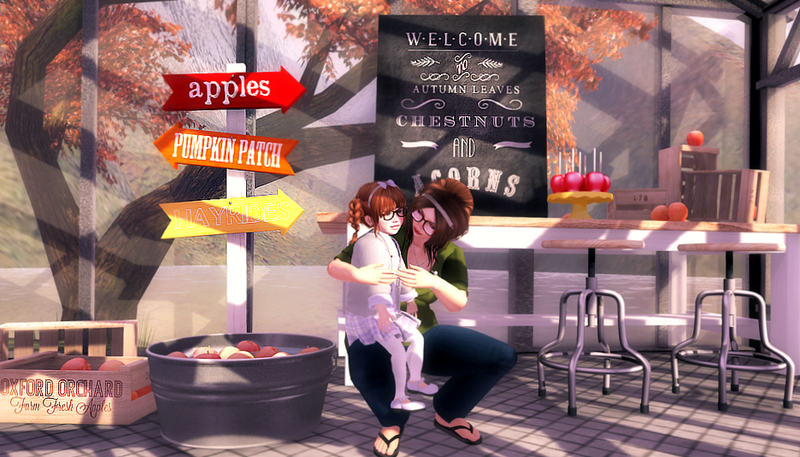 I snapped a few photos with my Ellie yesterday wearing and using some of the nice fall stuff from Collabor88. The stuff in the background is from Floorplan and Scarlet Apple. I love this set and think that the table and chairs are gonna be the new dining room table in our new house! I am wearing the sweater and jeans outfit from Decoy that is at Collabor88 as well as a little acorn necklace from Yummy. I have on new hair from Truth (not at collabor88) and the pose that we are using is from .click. Ellie (my little pumpkin pie) is wearing the Ella outfit from Petite Bowtique and her ginger braids are from Wasabi Pills. She’s adorable and I’m so happy to welcome her further into our happy family!